Dexter’s Granny was one of the bravest ladies I knew. During the 5 years I’d known her she’d been ill more than well, but she’d never let you know this. 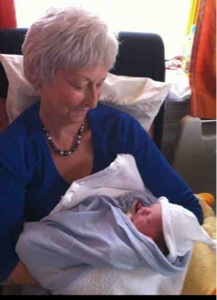 Having Cancer didn’t stop Granny from seeing her friends every week, watching live music and having a dance with Grandad, going on cruises, visiting relatives and friends all around the country, going to the races, watching shows, cooking amazing dinners and, most importantly, cuddling her grandson. Cancer had become part of her life and she never once sat down and let it consume her. Sharing the news that we were expecting a baby at Christmas 2010 came at a time when Granny needed a lift. It wasn’t until 2 weeks ago that I learnt Granny was convinced she’d never meet Dexter. In reality she saw him every week for nearly 6 months. The other half and I nicknamed the grandparents the paparazzi as they took so many photos of Dex! Even towards the end when she was too weak to hold him, I knew just having him there in the same room smiling and giggling was the tonic and lift that she needed. I feel so blessed and honoured to have been a part of such an amazing woman’s life. I promised her I’d look after her son and her grandson, my family, and give them all the love and support they needed. I can’t wait to show Dexter pictures of his beautiful Granny and tell him stories of her life to keep her memory alive. Treasure your families, you only get one.